Early McGrath didn’t want freedom from her thirty-year marriage to Nash, but when it was forced upon her, she did the only thing she knew to do—she went home to the Ridge to reinvent herself. Only what is someone who’s taken care of people her whole life supposed to do when no one needs her anymore? Even as the threads of her life unravel, she finds new ones— reconnecting with the church of her childhood, building the quilt shop that has been a long-time dream, and forging a new friendship with her former husband. The definition of freedom changes when it’s combined with faith. Can Early and Nash find a Soft Place to Fall? Earline McGrath didn’t know whether to laugh or cry, so she went into the garden and planted carrots. Nash hated carrots. This morning they’d met oh-so-civilly in his brother’s law office to finalize the division of thirty years’ accumulation of things like DVD players and Christmas tree ornaments with “Logan, Fist Graid” written on them in glitter glue. Now it seemed important to her to do something her husband disliked. Planting carrots made more sense than rearranging furniture and was easier on the back even if it was hard on the knees. Somewhere in the nightmare that was the three-car garage built to look like a wing on their pseudo-Victorian house, there were some kneepads from when the girls played high school volleyball. Early needed to find them. Only thing was, she’d find other stuff, too. Baby sleepers with spit-up stains, old diaries she should have burned years ago, and early marriage melamine dishes that would make her eyes sting and turn her heart into skip-a-beat mush. They’d married the day after Nash graduated, when Early was barely sixteen, just finishing up her sophomore year at the tiny high school in the middle of nowhere, Kentucky. She’d been eight weeks pregnant, but hardly anyone had known except Early’s friends Mary Brad, Lou Ann, and Emily. Even when she gave birth to Evan seven months later and he weighed in at nearly nine pounds, she’d scarcely looked pregnant. Nash hurried, but a train blocked their path and Evan Davis McGrath was born at the corner of Evans and Market with only his father and Mike Davis from the Marathon filling station in attendance. Mike said it was a quite a way to become someone’s godfather. Sitting in the loamy soil of her garden remembering the day Evan was born, Early decided she might as well laugh. In all truth, she’d laughed more in her thirty years with Nash than she’d cried, so it came naturally enough. Besides, it wasn’t as though they were mad at each other or their feelings were hurt. That was part of their problem; their feelings for each other didn’t seem to go deep enough anymore to be hurt. His nod propelled her to her feet with an inward sigh. The knees that had supported her unflinchingly for forty-six years, through learning to ride a bicycle and roller skate, and lots of praying and repenting, tired a lot more quickly than they used to. That was all there was to it. She might have to break down and move furniture after all, unless she was willing to find those kneepads. 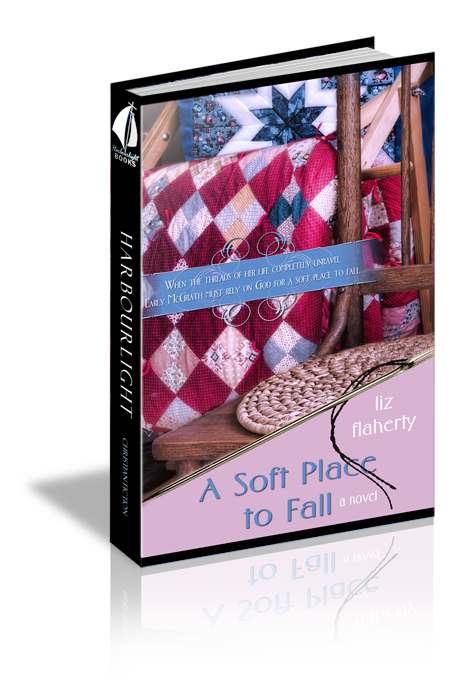 She would put Nash’s recliner in the garage, just set it smack in the middle of the spot where he used to park his SUV, and while she was at it, she’d shove the big flat-screen television he was so fond of out there, too. Then she could rent the garage to someone whose life had caught a change-up and left him bereft of a remote control and his own oversized chair. He could use the melamine dishes, too, and keep soft drinks and sliced cheese in the little refrigerator the kids had used at college. “You sure this is what you want?” Ben waited until they were closer to Donna’s than to the house to ask. Only the promise of two dips of strawberry cheesecake ice cream kept her from turning on her heel and heading back toward the gated entry of Canterbury Crossing. She walked in silence for a few minutes, not sure what to say to this man she’d loved all these many years. “I’m not the one who left,” she said evenly. And all of a sudden, standing in line at an ice cream stand with her father-in-law, the pain overwhelmed her, and Early was in tears. Not quiet, dignified weeping that would befit the soon-to-be ex-wife of a prominent doctor, but great, gulping sobs that left her face splotchy and the front of Ben’s shirt a wet mess. By the time they’d finished their ice cream, Early felt soothed, certain she could survive another day. “Thank you.” She slipped her hand into the crook of Ben’s elbow as they stepped from cement sidewalks to the pseudo-antique cobblestone ones of the subdivision. They stopped three doors down from Early’s house, commenting on the colors of paint workmen were applying to the tri-level across the street. Something in his voice alerted Early, and she glanced sharply at him. He’d lost color, and the skin of his arm was turning clammy right under her hand. It was seventy-one degrees and not the slightest bit humid. A mild spring day. Kneeling in the soft new grass of one of Canterbury Crossing’s most manicured lawns, Early looked around wildly. Surely someone would see them. She thought of the cell phone Nash was always urging her to carry around with her. She’d finally consented to keeping it in her car, where it certainly didn’t do any good right now. “We called 911.” The voice, breathless, came from above her. “Does he have a history of heart trouble?” One of the women who’d been working in her flowers knelt beside them, a trowel still in her hand. “Only having it broken.” Early hugged Ben’s shoulders, as though he would be safe as long as her arms were around him. She prayed silently, desperately. She was out of practice, but the Lord still listened. Surely He did. It seemed to take forever, but it was only minutes later that the wailing ambulance pulled under the porte-cochere of the hospital’s emergency room. Nash approached, a lab coat over his jeans and cotton sweater. He stayed out of the way of emergency room personnel. His face was grim, his brown eyes dark behind his glasses. Behind him came Evan, the third doctor in his father’s family practice, whose Dockers, white shirt, and tie had become as much a uniform as Nash’s jeans. Early repeated Ben’s words, seeing Nash’s flinch out of the corner of her eye. “He hasn’t regained consciousness,” she said. Tell me he’s going to wake up, or if he’s not, tell me he’s with Rosie at least in his mind. Don’t leave me swinging out here thinking it’s somehow all my fault. But they didn’t tell her anything. Nash didn’t even meet her eyes before he pushed his way through the doors into the emergency room. Evan hesitated a moment, then waved Early toward the waiting room before following his father’s flapping white coat. Someone in a pink smock brought her a cup of coffee, and she sipped greedily, thinking that as the wife of one doctor and the mother of another, she should probably don a pink smock more often herself. Except that she wasn’t a doctor’s wife any longer, she remembered, the coffee turning bitter on her tongue. Ben wasn’t the nearest thing to a father she had. She was no longer entitled to that proprietary little twinge she felt when other women looked at her husband. Her children were grown, professionals all. No one needed Early McGrath for anything. She was free. She’d dreamed of it often, while getting Nash through medical school, raising babies, and caring for Rosie through those dark last days, but dreaming of it and having it were two different things. By the time Evan emerged from behind the swinging doors, Early was on her third cup of coffee and had straightened the magazine racks twice. It was Thursday, Nash’s half-day and Evan’s day off. Early wondered why they even bothered with non-scheduled time, since the R and R never actually came to pass. She wished she had a dollar for every time she’d been left waiting for Nash’s promised timely arrival. Left waiting. Must be the story of a doctor’s wife, just as freedom was the story of the ex-wife. “OK.” She laid her hand in his, allowing him to help her to her feet. She didn’t respond to the old joke. Her line was, “Sure, but I’m a better cook,” and she’d said it a hundred times since it had ceased being funny. She didn’t have the emotional strength to make it a hundred and one. She was angry, and it was taking all she had to stay that way. “So let him move back home when he gets out of the hospital,” she said. “You and Joe can afford care for him until he gets back on his feet. For that matter, he can afford it for himself. You can go down on alternate weekends, especially since you’re both single. The kids will always go to visit their grandfather, no matter where he is.” She opened her door without looking at him again. Don’t! If he came in, he’d see her cry over his father and try to make her feel better. Then she’d end up offering to move down to the country with Ben because she had already been thinking that would be the easiest thing for everyone else. And I’m tired of doing the easiest thing for everyone else. Tired! Do you hear me? Oh, good grief, of course he didn’t hear her. Mind reading was the responsibility of the wife part of a marriage, not the husband one. The husband didn’t even have to listen to the spoken word. He just had to grunt often enough to show he was still alive. But Nash checked the house with all the impersonality of a bored police officer, told her he’d see her later and to take care now, and left. Early dropped clothes all the way to the bathroom and stepped under a stinging shower. And that was when she cried. Nash released a relieved sigh. Early looked so sad that he was afraid she was going to cry. Even if he wasn’t in love with his ex-wife anymore, even if he wasn’t sure he’d ever been, he didn’t like seeing her cry. She didn’t cry pretty, for one thing, with glistening eyes and tears hanging like diamonds from her lashes. No, Early cried noisy and splotchy. For another thing, even if she was crying over his father today, Nash was fairly certain his departure from their marriage and their home was at the root of it. He felt guilty, and he didn’t like the feeling a bit. And then there was the third thing. Beyond fairly, he was absolutely certain if Early had cried, he’d have cried with her. At the apartment complex where he rented a two-bedroom-two-bath in the same building that housed Joe, his thrice-divorced brother, and Evan, who enjoyed his bachelorhood to an extent that horrified Early, Nash left a message with his brother’s secretary and stepped into the shower. He let the spray wash lukewarm over him and leaned against the wall. This was probably what Early had done when he left; she always cried in the shower. It was, she informed him, how she’d survived raising four children and one husband.